DSCC says that Samsung Display's OLED utilization has started to improve as it is starting to produce new OLED displays for new smartphones by Samsung, Apple and other makers. 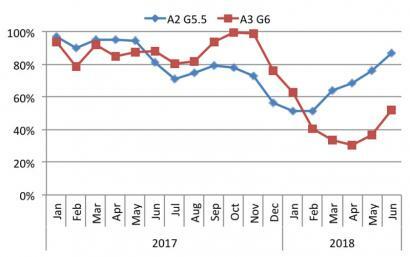 SDC's utilization rates started to improve in May 2018, with the rigid A2 OLED fab expected to exceed 80% in June. At 100% yields, the A2 can produce 175,000 monthly substrates. DSCC says that 5.5-inch to 6-inch rigid OLEDs cost will fall to $23 in Q3 2018, with the price premium over LTPS LCDs will be around $5. DSCC says that at such a small gap they expect demand for rigid OLEDs will remain strong.